The preliminary hearing to start today in a Riverside courtroom regarding animal abuse charges against former Los Angeles County assistant fire chief Glynn Johnson, 54, of Riverside. A judge is scheduled to begin reviewing evidence this morning in the animal cruelty case against the retired Los Angeles County assistant fire chief who left the department in disgrace shortly after the puppy killing incident. Former Chief Johnson is accused of hitting his neighbor's 6-month-old German Shepherd mix with a large 12 pound rock and attempting to break the dogs jaws. The dog's owners had to put their pet puppy "Karley" to sleep. Johnson claimed he was acting in self defense when the puppy latched on to his hand after he seized the dog from a neighbor that was trying to take the dog home. He has been accused of beating the puppy repeatably with a 12 pound rock. During the hearing, which may last for two days, a judge will review evidence and testimony to determine if there is enough evidence for Johnson to stand trial before a jury. 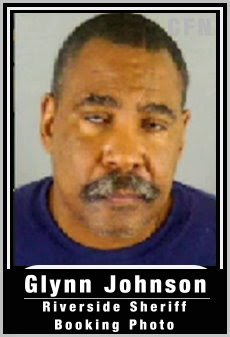 Bail: Glynn Johnson is free on bond and could face up to four years in prison if convicted.